You might have heard in the news or on the interwebs about the claims Apple had made about the antenna radios. In a nutshell, for those who may still be in the dark, Apple claimed that by “death gripping” a phone its signal would drastically diminish, much like the new iPhone 4 does due to its poor antenna radio design. Xtreme Labs has now released a free app that lets you try and “death grip” your BlackBerry. 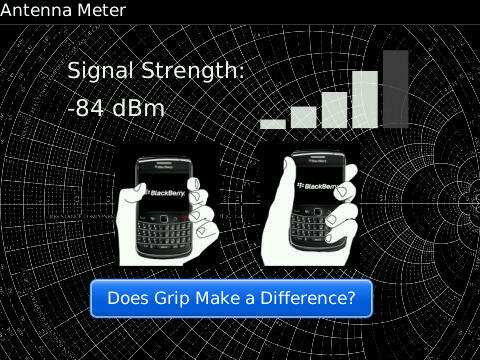 It shows you whether or not the way you are holding your BlackBerry affects the signal strength. Download the app OTA by clicking here.